Classic Brands Are Feeling The Crunch Of Changing Shopping Habits Big mainstream consumer brands, which have owned our cupboards and closets, face a turning point: a time to evolve or wither. The Internet and the echoes of the recession have changed us as shoppers. The world of mainstream consumer brands is in a major slow-motion transformation. Think about the last time you went to the supermarket. You probably spent no more than a few seconds choosing from all the different brands of toothpaste, frozen peas or oatmeal. Those few seconds used to be the holy grail for brands, the moment you would get hooked forever on that Tide detergent or Heinz ketchup — an event referred to as "the first moment of truth." But lately, the moment of truth has moved to the Internet. What's more, ripples from the 2008 recession have changed us as shoppers. More and more people have started saying: "I'm not a brand person." Those five fateful words come from Juliet McFadden, 23, an office manager in Boston. For consumer brands used to owning American cupboards and closets, that sentiment spells trouble and signals a turning point: evolve or wither. It has been a tumultuous period for giant consumer brand companies. Campbell Soup Co. is in the process of selling off parts of its business and welcoming a new chief executive. Procter & Gamble is restructuring. Unilever, which makes Dove soap and Hellmann's mayonnaise, has also hired a new CEO. 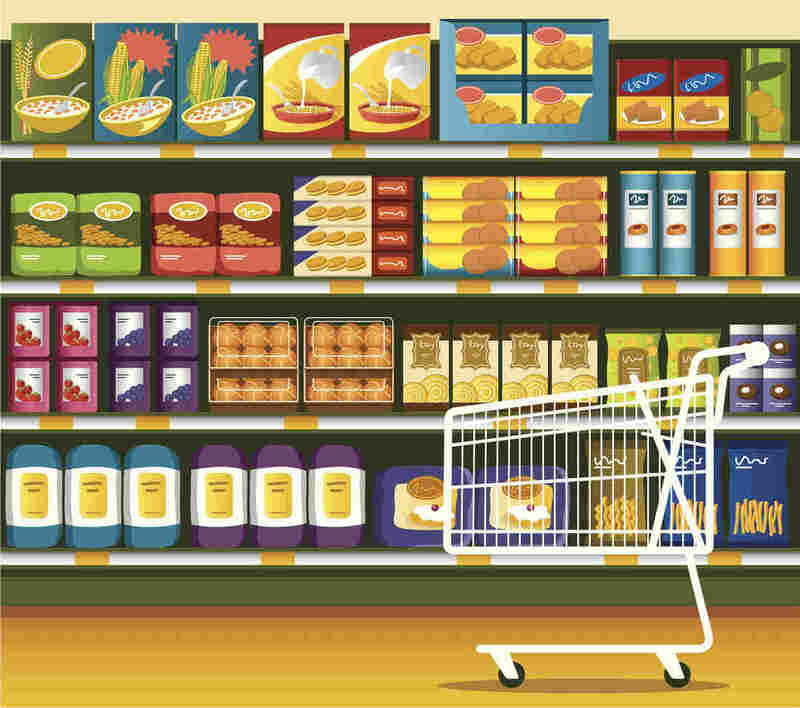 As far back as 2015, research firm Catalina reported that 90 of the top 100 brands in consumer packaged goods had lost market share. To understand that trend, consider a shopper like McFadden. She is just starting to build her finances and lifelong shopping habits. This makes her a prime target for consumer-goods companies like Procter & Gamble, Kraft Heinz or General Mills. But she's not easy to win over. For example, McFadden doesn't like cereal. "I just don't usually eat breakfast," she says. She doesn't drink soda and dislikes yogurts "with a ton of sugar with them." She doesn't buy paper towels and prefers reusable washable rags. "Paper towels are expensive," she says. "Stuff like that adds up." The tastes of McFadden's generation often get treated with the tired trope about millennials killing breakfast cereal, napkins, bar soap, canned tuna. But really, most Americans could make a similar list. Maybe you choose the store brand of toilet paper; or you buy a fancier condiment instead of Hellmann's mayo; or you order eco-friendly diapers on the Internet. "Rather than just relying on brand familiarity, consumers buy today what performs for them. They are much less brand-loyal," says David Luttenberger of market-research firm Mintel. "They are more driven by performance, by convenience, by price." During the Great Recession, Americans warmed up to cheaper off-brand products, like generic or store brands. And then, they kept buying them even as the economy improved. Like in the music industry, very few artists can continue being successful in the sophomore and junior album. ... It is a big challenge to reinvent yourself over and over again. Plus, the Internet — of course — has completely shaken up shopping. Think about how people used to discover new brands. Only the biggest conglomerates could afford prime TV advertising and prominent placement in stores, right around eye level. And so the baby boomer generation of shoppers grew up reaching for ubiquitous products like Campbell's soup, Heinz ketchup, Oscar Mayer hot dogs or P&G's Crest toothpaste. Some of these names remain longtime favorites among loyal older shoppers. In a 2018 Morning Consult poll, Procter & Gamble and Kimberly-Clark were the two top brands preferred by boomers, far more than U.S. adults overall. Meanwhile, tech investors have been funding startups to bring Silicon Valley "disruption" to products such as toothbrushes, vitamins and tampons. Wall Street has become cautious about once-dominant consumer brands. Shares of companies like Kellogg, Kraft Heinz and General Mills recently hit their lowest levels in years. "They're in a bit of a pickle," says Americus Reed, marketing professor at the University of Pennsylvania's Wharton School. "Like in the music industry, very few artists can continue being successful in the sophomore and junior album, right? ... It is a big challenge to reinvent yourself over and over again." But that's exactly what companies are trying to do with brands to survive. In 2017, Procter & Gamble cut the price of its razors and replacement blades to compete against online-subscription upstarts Dollar Shave Club and Harry's. Rival Unilever went all in and bought the Dollar Shave Club for $1 billion. Kimberly-Clark — whose brands include Kleenex, Huggies and Kotex — was struggling so much that it announced plans to lay off 13 percent of its workers and shutter 10 plants. Among various brand revamps, the company has launched a new Scott toilet paper without the center tube to appeal to the environmentally conscious shopper. General Mills renamed the classic Hamburger Helper as simply "Helper." In a quiet feat, Kraft Heinz managed to take out artificial preservatives and dyes from its classic macaroni and cheese without angering devotees. The 149-year-old Campbell Soup Co. has been the poster child of the struggle to adjust to an age where people want convenient, fresher products with ingredients they can pronounce. Canonized by Andy Warhol in the heat-and-serve postwar era, Campbell is acutely feeling Americans' waning appetite for canned and condensed soups. It's trying to hold on to its huge share of the market with cleaner labels showing fresh ingredients, containers meant for sipping and modern flavors like toasted barley. Another staple feeling the pressure is breakfast cereal, with nostalgic brands like Kellogg's Frosted Flakes and Froot Loops; General Mills' Lucky Charms and Cheerios; PepsiCo's Life and Cap'n Crunch. Sales here have been declining for years. Mintel predicts an additional 5 percent decline through 2023, as people aren't swayed by reduced-sugar offerings and choose to skip breakfast or opt for more portable, warmer and more nutritious options. "You've got a lot of CEOs that are at their wits' end trying to figure out growth," The Wall Street Journal cited "a now-retired big-food-company chief" as saying in May 2018. The article said at least 16 CEOs of major packaged-food and beverage companies had stepped down in the previous two years. "The challenge for these legacy brands is that the people that were born into them are going to die," says Reed, the marketing professor, "and so you better have a plan to talk to these younger types of consumers."